Joshua Youngblood, Claire Hutchinson and Josh Smith examine 17th-century Japanese woodblock prints. Rare books librarian Joshua Youngblood raised a blue-dyed volume of the history of the Han Dynasty to his nose. "It has a resin-y smell, which is surprising," he said. 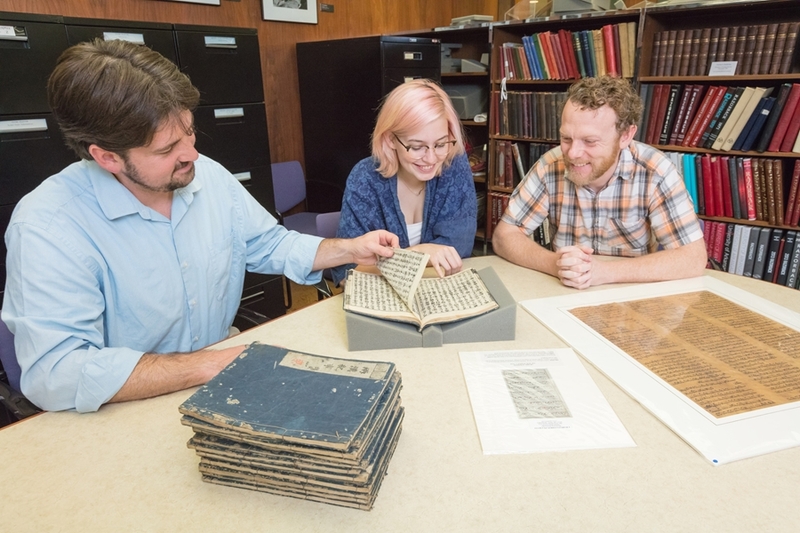 With English professor Joshua Byron Smith and honors creative writing and classical studies sophomore, Claire Hutchinson, Youngblood carefully thumbed through the Japanese paper volumes. The three speculated about details in the books' construction — the thinness of the paper, the purpose of marginalia and the nature of the leaf pulp that formed a base for the binding. These Japanese woodblock prints help fill a gap in the university's rare books library: "We have very few Asian materials in Special Collections," Youngblood said. "And this is now the oldest East Asian piece we have by about 200 years." Hutchinson argued for the acquisition of this text, along with two other manuscript fragments in Hebrew and Arabic, in a proposal written to fulfill an assignment for Smith's spring 2018 Honors College Signature Seminar "Manuscript." The Honors College provided a financial donation to facilitate the purchase of the texts. "Our partnership with the Honors College has been great," Youngblood said. "Being able to hold classes like Dr. Smith's where students engage with our materials in an in-depth way means we're able to plug into campus in ways that aren't always possible." During the course, Hutchinson said, "We came down to Special Collections a lot to handle the manuscripts, because an important part of the class was this hands-on experience. I noticed that the vast majority of the pieces were in Latin or were Biblical manuscripts from Europe." She decided to use her proposal to help balance the cultural scales. "Claire's proposal had everything we were looking for," Smith said. "She found interesting, affordable items that filled cultural and historical gaps in the library's collection." "These are things we've never focused on in our collections," added Youngblood. "Claire did a very good job emphasizing cultural diversity." And these manuscripts aren't simply display pieces; they're functional, too: "These are very versatile texts," said Smith. "they will be of interest to a wide variety of departments and courses." The potential applications, from Islamic cultural studies, to the spread of the Jewish written tradition during the Diaspora, to textual history in general, are broad and exciting. A North African scroll fragment of the Torah featuring the Ten Commandments from the book of Exodus; ink on deerskin, Hebrew, early to mid-18th century. A fragment of the Quran featuring an excerpt of "The Life of the Prophet" from The Arabic Sermons; black and red ink with gold and blue margin ruling, Arabic, 1650. A 14-volume history of the Han Dynasty; woodblock prints on Japanese paper, bound in leaf covers made from bamboo and rice, Japanese, 1690. These artifacts are currently being catalogued by University Libraries and will be on display as part of the Special Collections Open House event on Oct. 25 in celebration of National Archives Month. All of Hutchinson's acquisitions will be available to researchers (including students!) by the end of the semester.